Greenfield Calligraphy Nib - Single piece. Designed for both left and right handers. Can be used interchangeably with Greenfield fountain or calligraphy pen. 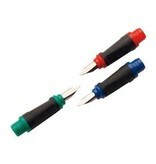 Tipping width: 1.1 mm green, 1.5 mm blue, 1.9 mm red.